Canadians spend too much money they don't have. It should. Economists have been sounding the alarm about consumer debt for the last few years. It was also a recurring mantra of our late finance minister, Jim Flaherty. Yet despite all the warnings, a new Statistics Canada report suggests Canadians continue their free-spending ways, which experts say is due to a carefree outlook on borrowing money. "People seem to have a laissez-faire attitude toward debt right now, simply because what's been shoved down our throats — that interest rates are at an all-time low, and life is great… and the economy is not bad," says Laurie Campbell, CEO of Credit Canada Debt Solutions. "It all just gives people a false sense of security." According to a recent report by credit monitoring firm Equifax, the total amount of Canadian credit market debt — a figure that includes mortgages, non-mortgage loans and consumer credit — rose to $1.529 trillion at the end of 2014. The bulk of this increase was new mortgage debt, suggesting Canadians are continuing to take advantage of lower interest rates to dive into the ever-burgeoning housing market. According to Statistics Canada, Canadians' debt-to-income ratio in the fourth quarter of 2014 was at an all-time high of 163 per cent. That means for every dollar of income, Canadians carry $1.63 of debt. As a credit counsellor, Campbell is on the front lines of the debt debacle, and says that the biggest problem for most people remains credit cards, which she says are too easy to obtain and so encourage people to fulfill all of their consumer desires. She says many cardholders don't know that the average interest rate is about 20 per cent. "It's very easy to impulse-purchase on — it doesn't feel like money," says Campbell. But credit cards are only one small part of the larger picture. Another reason Canadian consumers are so debt-laden is that banks "are coming up with all these unique and different ways of lending money all the time," says Toronto-based personal finance expert Rubina Ahmed-Haq. Home equity loans, which allow consumers to borrow on the value of their homes, have been especially popular in recent years, and so have bank car loans. Moody's Investor Service reports that bank car lending — which typically has modest interest rates and long amortization periods, thus keeping monthly payments low — has grown at an annual rate of 20 per cent since 2007. By far the biggest component of household debt, however, is mortgages. Given the seemingly unstoppable rise in home prices in Canada's biggest cities, consumers are taking on massive mortgages to get into the housing market. 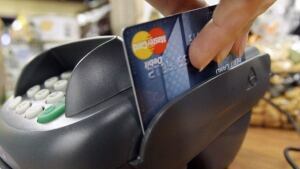 According to a new report by the Royal Bank of Canada, mortgages are responsible for the recent jump in household debt. New residential mortgages rose 5.4 per cent in January compared to a year earlier, to over $1.2 trillion. The main reason Canadians have been able to take on more mortgage debt is because interest rates are at an all-time low, thanks in part to the surprise cut in January to the prime rate set by the Bank of Canada, which is currently 0.75 per cent. Ahmed-Haq says the previous Bank of Canada governor, Mark Carney, was "like a father figure," constantly reminding Canadians to be aware of household debt and the fact that interest rates would eventually rise. "There was always this underlying feeling that he's aware and he's concerned," she says. She doesn't see the same level of concern from current governor Stephen Poloz. But Ahmed-Haq also admits that people may have the wrong impression of the central banker's mandate. "People always think the Bank of Canada is there to help us borrow money," she says. 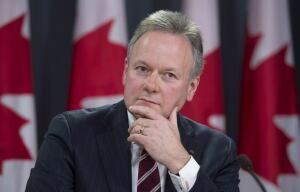 "But the Bank of Canada is really just there to make sure inflation stays in check." Sal Guatieri, a senior economist at BMO Capital Markets, acknowledges that "household credit growth has picked up a little bit in response to lower interest rates." But he also notes that Canada's current personal debt ratio of 163 per cent is still lower than the U.S. record in 2007, just before the economic collapse, which was 177 per cent. "There is a reason to be concerned, but not to the point that we should panic," says Gautieri. Even so, a recent report from the McKinsey Global Institute says that between 2007 and mid-2014, only one country had larger growth in household debt than Canada — Greece. While many experts blame our debt spiral on consumer temptation, an abundance of attractive borrowing options and a collective lack of impulse control, government must shoulder some of the blame, says Mario Seccareccia, an economics professor at the University of Ottawa. Seccareccia says any economy is "a simple accounting relationship" in which transactions take place both within the private sector, namely businesses and households, but also between the public sector and the private sector. In order for the economy to grow, there must be at least one sector that spends more than it receives — in other words, "somebody has to go into debt," says Seccareccia. And after the global financial meltdown in 2008, the Canadian government ran deficits in order to stimulate consumer spending and allow households to pay off some of their debt. But in recent years, the federal government especially has been aggressively trying to balance its budget, largely by reducing program spending and cutting jobs in the civil service, which can mean less disposable income for the many families relying on that spending. "A deficit in the public sector is a net saving in the private sector," says Seccareccia. "So if the public sector reduces its deficit, it's merely destroying savings of the private sector, and it's going to hit the household sector."